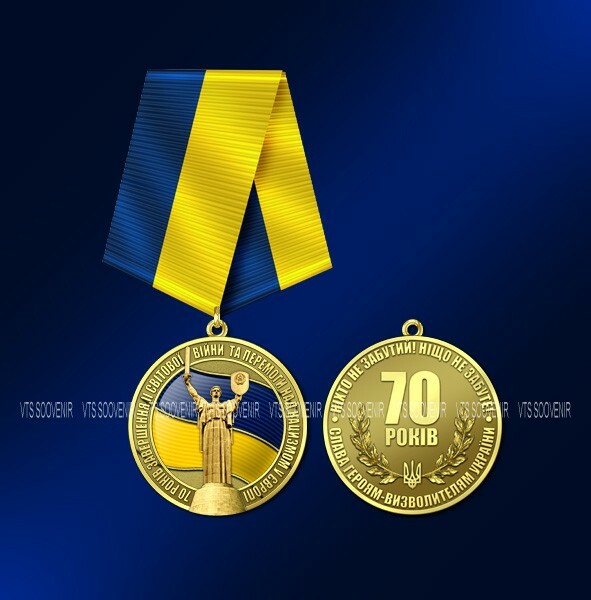 Medals and awards medals at the board and other insignia - products, which specializes in the production of our organization. These signs are an essential attribute of honor at the ceremonial awarding of participants in various fighting for their military successes and exploits. In support of this long-standing tradition of excellent, we are improving their skills and manufacturing medals, awards, prizes and souvenirs, expanding the range of premium merchandise and are working to ensure that our products are always made to meet the highest quality and the most demanding customers. Speaking about the exploits and heroism to mind in the first place come the military achievements of veterans of World War II - one of the largest, fiercest and bloodiest war in world history. This year on May 9 will be not just a holiday in honor of the victory over the forces of the Soviet army invaders, but perhaps the last chance to congratulate the remaining veterans with such a significant anniversary - the 70th anniversary of the Great Victory. Therefore, it is important to honor the memory of the fallen and to show their respect and recognition surviving veterans, the number of which, unfortunately, decreases with each passing year. In honor of this significant round date, we have prepared a special award - the commemorative medal 70 years victory in the gift set, which is ideal as a souvenir. As part of the kit you will find the original military medals, a cardboard box with a velvet lodgment and certification records for leatherette. Complete price of the coin is optimal and is 140 hryvnia, the cost of a separate medals check with sales managers of our company. 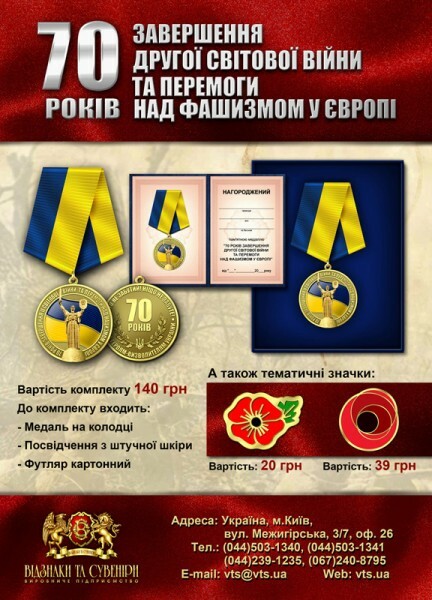 Here you can order a custom-made medals for the upcoming 70th anniversary of Victory Day. Medals for the order may be cast, stamped or etched, depending on the wishes of the customer. In addition to such breastplates can offer diverse design mounts in the form of pads, as well as various cases and identity, complete with that anniversary, souvenirand military medals will look more presentable and will be the bestreward for deserving heroes. We sincerely thank our veterans for their selfless struggle and hard-won victory, because his life we owe these heroes. This festive set of medals - a way to express our gratitude and appreciation. Sincerely, The company "VTS souvenir!"